Are you in the market for a new truck? Today’s truck is made for every man. Trucks are no longer for the construction worker or dude on a ranch. Trucks today come with packages for the business man, the working mom and even the college student. If you are interested in a truck with an impressive design and even more impressive features, take a look at the 2014 Chevrolet Silverado High Country. 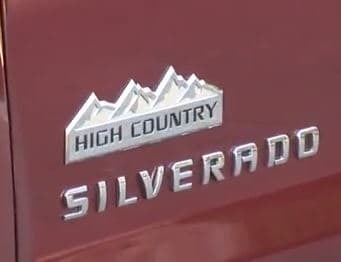 The new Silverado High Country has a luxury package that is sure to amaze. This article is about the truck’s luxury package and what you can expect to experience from this amazing car. First glance at the Silverado High Country, you will notice its strong rugged exterior, bold chrome grille with horizontal chrome bars. The truck sits high and strong on 20 inch chrome wheels fitted with all-season tires. Chevrolet added several chrome touches to the Silverado High Country on the side mirrors and door handles. The attention to detail was never missed on this truck. Jump inside the well-designed Silverado High Country and immediately you will notice the Chevrolet Silverado’s “High Country” logo on the premium leather front bucket seats. The seats come with a heating and cooling option and the steering wheel comes with a heating option. The truck is equipped with an amazing Bose premium audio sound system for your listening pleasure. The Silverado High Country has very impressive features on the inside made with your comfort in mind. It has everything inside to make your drive smooth and luxurious. Do not underestimate the truck’s added luxury features for weakness though. Under the hood this truck has a 355 horsepower engine and a maximum payload of 1,957 pounds. In other words, when you want the Silverado High Country to act like a truck, it doesn’t disappoint. The Chevrolet Silverado High Country is definitely a truck to be reckoned with. It packs a lot of power for the toughest jobs. Inversely, the same truck can be cleaned up after a long hard day’s work and taken to the finest restaurant. For added luxury don’t hesitate to add a navigational system and DVD player in the back seat. These features can be added to complement the luxury package. The 2014 Silverado High Country is surely a sight to see. This truck is made for anyone who enjoys a good ride, a strong car, and an impressive engine.